Contact Lenses are more regulated than guns? 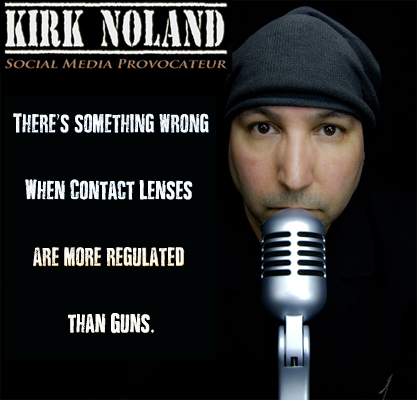 Today contact lenses are more regulated than guns. Think about that. A contact lens which is 50% water is more regulated than a weapon! The Fairness to Contact Lens Consumer Act, signed into law by George W. Bush on Dec. 6, 2003, included a provision that makes it illegal for anyone to purchase new contact lenses without a prescription. And to get a new prescription, you must visit and pay an optometrist to puff your eyes with a burst of air, dilate them with a painful chemical and shine a bright light into them, all in the name of healthy eye care. In many states, it is the “law” that this must be done at least once a year. In Maine it is a period not to exceed 24 months. How did the U.S. government get in the business of legislating how often I must pay my optometrist to check my eyes before I am allowed to buy a little lens that is more than 50 percent water? First, the Contact Lens Association hired lobbyists to help push for a new federal law. Then, Rep. Ed Whitfield, R-Ky., the chairman of the Oversight and Investigation Subcommittee, introduced the Contact Lens Consumer Health Protection Act. This is the same representative that voted against HR 2122, the “Mandatory Gun Show Background Check Act.” This is the same representative who opposes any new restrictions on assault weapons and opposes any type of registry for gun owners.